If you have a few baby socks that have lost their mates, there's no need to throw them away. Instead, you can use them to create an adorable rattle toy for your little one. This fun craft project also makes a great baby gift. This adorable baby rattle is easy and inexpensive to make from a few craft supplies. What's more, it's baby-safe. Every piece of the rattle is sewn down securely, and the noise-maker is large enough that it doesn't pose a choking hazard. When baby shakes this sweet stuffed doll, it makes a fun rattling sound. Push stuffing into the toe of the white or skin-toned sock until you can create a round ball. You'll want the stuffing to be quite firm. Use the twist tie to gather the sock together below this ball and hold it in place while you sew. Thread a needle with a double length of white or skin-toned thread and take several stitches just above the twist tie. Then bring the thread all the way around the sock and send the needle through again. Repeat until you have very securely closed the "neck" of the sock. Make sure your thread is knotted tightly before cutting it. Remove the twist tie. Wrap the rattle insert in stuffing and push it into the remaining open area of the sock. Continue adding stuffing to create the body of the baby. When the body is the size you want, use a double length of thread to close the bottom. Take large stitches to gather up the opening, and then pull to close it tightly. Sew around the bottom several more times to make sure it is very secure. Knot your thread and trim it. Cut one of the colored baby socks at the ankle, just above the heel. Slip this colored sock over the body of the rattle, hiding your stitches from closing up the bottom. Pull the colored sock up until it reaches the neck. Use matching embroidery floss to tightly sew the colored sock to the body. You can use a fun decorative stitch or simply sew it on, but make sure your stitches are very secure. Tightly knot the floss when you're done, and trim the end. Cut the other colored sock off at the toe to create the hat for the baby. Slip it over the head of the rattle, but don't sew it on yet. Instead, use it to hide your knots when you sew the face. Use brown embroidery floss for the eyes and red for the mouth. Then pull the hat down to hide the knots and use matching floss to sew it securely on the head. You're done! Embroider buttons on the front of the body. Remember not to use real buttons to keep the rattle baby-safe. Make the rattle look like the baby who will use it. Choose a baby sock for the hat in the appropriate hair color and match the embroidery floss to the baby's eye color. Stitch the baby's name on the rattle for a personal touch. Add a stitched image of a pacifier, baby bottle, or other accessory using embroidery floss. 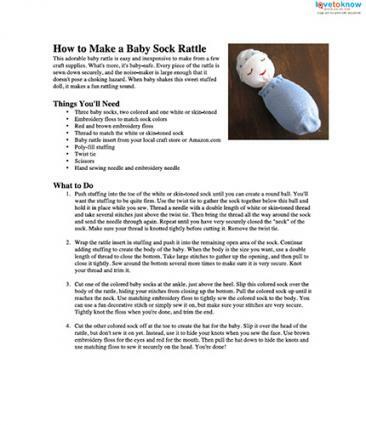 Use a striped or patterned sock for the body to give your rattle a cute, custom look. Use this template for a printable version of these instructions. Simply click on the image below to open up the .pdf file, and then print it out or save it to your computer for later use. Click to download the instruction sheet. Baby sock rattles are a great way to get extra use out of socks after your baby has outgrown them, as well as a fun method for using socks without mates. You can use these easy instructions to make an adorable baby toy that will bring a smile to the face of your favorite little one.